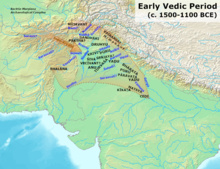 The Vedic period, or Vedic age (c. 1500 – c. 500 BCE), is the period in the history of the northern Indian subcontinent between the end of the urban Indus Valley Civilisation and a second urbanisation which began in the central Indo-Gangetic Plain c. 600 BCE. It gets its name from the Vedas, which are liturgical texts containing details of life during this period that have been interpreted to be historical and constitute the primary sources for understanding the period. These documents, alongside the corresponding archaeological record, allow for the evolution of the Vedic culture to be traced and inferred. The Vedas were composed and orally transmitted with precision by speakers of an Old Indo-Aryan language who had migrated into the northwestern regions of the Indian subcontinent early in this period. The Vedic society was patriarchal and patrilineal. Early Vedic Aryans were a Late Bronze Age society centred in the Punjab, organised into tribes rather than kingdoms, and primarily sustained by a pastoral way of life. Around c. 1200–1000 BCE, Vedic Aryans spread eastward to the fertile western Ganges Plain and adopted iron tools which allowed for clearing of forest and the adoption of a more settled, agricultural way of life. The second half of the Vedic period was characterised by the emergence of towns, kingdoms, and a complex social differentiation distinctive to India, and the Kuru Kingdom‘s codification of orthodox sacrificial ritual. During this time, the central Ganges Plain was dominated by a related but non-Vedic Indo-Aryan culture. The end of the Vedic period witnessed the rise of true cities and large states (called mahajanapadas) as well as śramaṇa movements (including Jainism and Buddhism) which challenged the Vedic orthodoxy. The Vedic period saw the emergence of a hierarchy of social classes that would remain influential. Vedic religion developed into Brahmanical orthodoxy, and around the beginning of the Common Era, the Vedic tradition formed one of the main constituents of the so-called “Hindu synthesis“. Archaeological cultures identified with phases of Vedic material culture include the Ochre Coloured Pottery culture, the Gandhara grave culture, the Black and red ware culture and the Painted Grey Ware culture. Archaeological cultures associated with Indo-Iranian migrations (after EIEC). 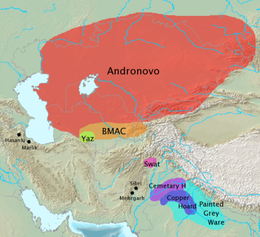 The Andronovo, BMAC and Yaz cultures have often been associated with Indo-Iranian migrations. The GGC, Cemetery H, Copper Hoard and PGW cultures are candidates for cultures associated with Indo-Aryan movements. The Rigveda contains accounts of conflicts between the Aryas and the Dasas and Dasyus. It describes Dasas and Dasyus as people who do not perform sacrifices (akratu) or obey the commandments of gods (avrata). Their speech is described as mridhra which could variously mean soft, uncouth, hostile, scornful or abusive. Other adjectives which describe their physical appearance are subject to many interpretations. However, some modern scholars such as Asko Parpola connect the Dasas and Dasyus to Iranian tribes Dahae and Dahyu and believe that Dasas and Dasyus were early Indo-Aryan immigrants who arrived into the subcontinent before the Vedic Aryans. Accounts of military conflicts between the various tribes of Vedic Aryans are also described in the Rigveda. Most notable of such conflicts was the Battle of Ten Kings, which took place on the banks of the river Parushni (modern day Ravi). [note 4] The battle was fought between the tribe Bharatas, led by their chief Sudas, against a confederation of ten tribes. The Bharatas lived around the upper regions of the river Saraswati, while the Purus, their western neighbours, lived along the lower regions of Saraswati. The other tribes dwelt north-west of the Bharatas in the region of Punjab. Division of the waters of Ravi could have been a reason for the war. [unreliable source?] The confederation of tribes tried to inundate the Bharatas by opening the embankments of Ravi, yet Sudas emerged victorious in the Battle of Ten Kings. Purukutsa, the chief of the Purus, was killed in the battle and the Bharatas and the Purus merged into a new tribe, the Kuru, after the war. After the 12th century BCE, as the Rigveda had taken its final form, the Vedic society, which is associated with the Kuru-Pancala region but were not the only Indo-Aryan people in northern India, transitioned from semi-nomadic life to settled agriculture in north-western India. Possession of horses remained an important priority of Vedic leaders and a remnant of the nomadic lifestyle, resulting in trade routes beyond the Hindu Kush to maintain this supply as horses needed for cavalry and sacrifice could not be bred in India. The Gangetic plains had remained out of bounds to the Vedic tribes because of thick forest cover. After 1000 BCE, the use of iron axes and ploughs became widespread and the jungles could be cleared with ease. This enabled the Vedic Aryans to extent their settlements into the western area of the Ganga-Yamuna Doab. Many of the old tribes coalesced to form larger political units. The Vedic religion was further developed with the emergence of the Kuru kingdom, systematising its religious literature and developing the Śrauta ritual. It is associated with the Painted Grey Ware culture (c.1200-600 BCE), which did not expand east of the Ganga-Yamnuya Doab. It differed from the related, yet markedly different, culture of the Central Ganges region, which was associated with the Northern Black Polished Ware and the Mahajanapadas of Kosala and Magadha. In this period the varna system emerged, state Kulke and Rothermund, which in this stage of Indian history were a “hierarchical order of estates which reflected a division of labor among various social classes”. The Vedic period estates were four: Brahmin priests and warrior nobility stood on top, free peasants and traders were the third, and slaves, labourers and artisans, many belonging to the indigenous people, were the fourth. This was a period where agriculture, metal, and commodity production, as well as trade, greatly expanded, and the Vedic era texts including the early Upanishads and many Sutras important to later Hindu culture were completed. Modern replica of utensils and falcon shaped altar used for Agnicayana, an elaborate Śrauta ritual originating from the Kuru Kingdom, around 1000 BCE. The Kuru Kingdom, the earliest Vedic “state”, was formed by a “super-tribe” which joined several tribes in a new unit. To govern this state, Vedic hymns were collected and transcribed, and new rituals were developed, which formed the now orthodox Śrauta rituals. Two key figures in this process of the development of the Kuru state were the king Parikshit and his successor Janamejaya, transforming this realm into the dominant political and cultural power of northern Iron Age India. The most well-known of the new religious sacrifices that arose in this period were the Ashvamedha (horse sacrifice). This sacrifice involved setting a consecrated horse free to roam the kingdoms for a year. The horse was followed by a chosen band of warriors. The kingdoms and chiefdoms in which the horse wandered had to pay homage or prepare to battle the king to whom the horse belonged. This sacrifice put considerable pressure on inter-state relations in this era. This period saw also the beginning of the social stratification by the use of varna, the division of Vedic society in Kshatriya, Brahmins, Vaishya and Shudra. The Kuru kingdom declined after its defeat by the non-Vedic Salva tribe, and the political centre of Vedic culture shifted east, into the Panchala kingdom on the Ganges, under King Keśin Dālbhya (approximately between 900 and 750 BCE). Later, in the 8th or 7th century BCE, the kingdom of Videha emerged as a political centre farther to the East, in what is today northern Bihar of India and southeastern Nepal, reaching its prominence under the king Janaka, whose court provided patronage for Brahmin sages and philosophers such as Yajnavalkya, Uddalaka Aruni, and Gargi Vachaknavi; Panchala also remained prominent during this period, under its king Pravahana Jaivali. By the 6th century BCE, the political units consolidated into large kingdoms called Mahajanapadas. The process of urbanisation had begun in these kingdoms, commerce and travel flourished, even regions separated by large distances became easy to access. Anga, a small kingdom to the east of Magadha (on the door step of modern-day West Bengal), formed the eastern boundary of the Vedic culture. Yadavas expanded towards the south and settled in Mathura. To the south of their kingdom was Vatsa which was governed from its capital Kausambi. The Narmada River and parts of North Western Deccan formed the southern limits. The newly formed states struggled for supremacy and started displaying imperial ambitions. The end of the Vedic period is marked by linguistic, cultural and political changes. The grammar of Pāṇini marks a final apex in the codification of Sutra texts, and at the same time the beginning of Classical Sanskrit. The invasion of Darius I of the Indus valley in the early 6th century BCE marks the beginning of outside influence, continued in the kingdoms of the Indo-Greeks. Meanwhile, in the Kosala-Magadha region, the shramana movements (including Jainism and Buddhism) objected the self-imposed authority and orthodoxy of the intruding Brahmins and their Vedic scriptures and ritual. According to Bronkhorst, the sramana culture arose in “greater Magadha,” which was Indo-European, but not Vedic. In this culture, kshatriyas were placed higher than Brahmins, and it rejected Vedic authority and rituals. O, Indra, fond of soma, would you make me the protector of people, or would you make me a king, would you make me a sage who has drunk soma, would you impart to me endless wealth. The Vedic household was patriarchal and patrilineal. The institution of marriage was important and different types of marriages— monogamy, polygyny and polyandry are mentioned in the Rigveda. Both women sages and female gods were known to Vedic Aryans. However, hymns attributable to female sages are few and female gods were not as important as male ones. Women could choose their husbands and could remarry if their husbands died or disappeared. While the wife enjoyed a respectable position, she was subordinate to her husband. People consumed milk, milk products, grains, fruits, and vegetables. Meat eating is mentioned, however, cows are labelled aghnya (not to be killed). Clothes of cotton, wool and animal skin were worn. Soma and sura were popular drinks in the Vedic society, of which soma was sanctified by religion. Flute (vana), lute (vina), harp, cymbals, and drums were the musical instruments played and a heptatonic scale was used. Dancing, dramas, chariot racing, and gambling were other popular pastimes. Ancient Indian Antennae sword; Metalwork, 1500–500 BCE. Ancient Indian Ax Blade, 1500–1000 BCE. Early Vedic Aryans were organised into tribes rather than kingdoms. The chief of a tribe was called a rajan. The autonomy of the rajan was restricted by the tribal councils called sabha and samiti. The two bodies were, in part, responsible for the governance of the tribe. The rajan could not accede to the throne without their approval. The distinction between the two bodies is not clear. Arthur Llewellyn Basham, a noted historian and indologist, theorises that sabha was a meeting of great men in the tribe, whereas, samiti was a meeting of all free tribesmen. Some tribes had no hereditary chiefs and were directly governed by the tribal councils. Rajan had a rudimentary court which was attended by courtiers (sabhasad) and chiefs of sects (gramani). The main responsibility of the rajan was to protect the tribe. He was aided by several functionaries, including the purohita (chaplain), the senani (army chief), dutas (envoys) and spash (spies). Purohita performed ceremonies and spells for success in war and prosperity in peace. In the later Vedic period, the tribes had consolidated into small kingdoms, which had a capital and a rudimentary administrative system. To aid in governing these new states, the kings and their Brahmin priests arranged Vedic hymns into collections and developed a new set of rituals (the now orthodox Śrauta rituals) to strengthen the emerging social hierarchy. The rajan was seen as the custodian of social order and the protector of rashtra (polity). Hereditary kingship started emerging and competitions like chariot races, cattle raids, and games of dice, which previously decided who was worthy of becoming a king, became nominal. Rituals in this era exalted the status of the king over his people. He was occasionally referred to as samrat (supreme ruler). The rajan’s increasing political power enabled him to gain greater control over the productive resources. The voluntary gift offering (bali) became compulsory tribute; however, there was no organised system of taxation. Sabha and samiti are still mentioned in later Vedic texts, though, with the increasing power of the king, their influence declined. By the end of the later Vedic age, different kinds of political systems such as monarchical states (rajya), oligarchical states (gana or sangha), and tribal principalities had emerged in India. According to Michael Witzel‘s analysis of the Kuru Kingdom, it can be characterized as the earliest Vedic “state”, during the Middle Vedic Period. However, Robert Bellah observes that it is difficult to “pin down” whether the Kurus were a true “state” or a complex chiefdom, as the Kuru kings notably never adopted royal titles higher than “rājan,” which means “chief” rather than “king” in the Vedic context. The Middle Vedic Period is also characterized by a lack of cities; Bellah compares this to early state formation in ancient Hawai’i and “very early Egypt,” which were “territorial states” rather than “city-states,” and thus “it was the court, not the city, that provided the center, and the court was often peripatetic.” Romila Thapar characterizes Vedic-era state formation as being in a condition of “arrested development,” because local chiefs were relatively autonomous, and because surplus wealth that could have been directed towards state-building was instead used for the increasingly grandiose rituals that also served to structure social relations. The period of the Upanishads, the final phase of the Vedic era, was approximately contemporaneous with a new wave of state formations, linked to the beginning of urbanization in the Ganges Valley: along with the growth of population and trade networks, these social and economic changes put pressure on older ways of life, setting the stage for the Upanishads and the subsequent sramana movements, and the end of the Vedic Period, which was followed by the Mahajanapada period. , archaeological data for the period of period from 1000 to 600 BCE shows a two-tiered settlement pattern in the Ganges Valley, with some “modest central places,” suggestive of the existence of simple chiefdoms, with the Kurukshetra District itself displaying a more complex (albeit not yet urbanized) three-tiered hierarchy. Subsequently, (after 600 BCE) there are four tiers of site sizes, including large towns and fortified cities, consistent with an urbanized state-level society. Ceramic goblet from Navdatoli, Malwa, 1300 BCE. Economy in the Vedic period was sustained by a combination of pastoralism and agriculture. There are references, in the Rigveda, to the leveling of fields, seed processing, and storage of grains in large jars. War bounty was also a major source of wealth. Economic exchanges were conducted by gift giving, particularly to kings (bali) and priests (dana), and barter using cattle as a unit of currency. While gold is mentioned in some hymns, there is no indication of the use of coins. Metallurgy is not mentioned in the Rigveda, but the word ayas and instruments made from it such as razors, bangles, axes are mentioned. One verse mentions purification of ayas. Some scholars believe that ayas refers to iron and the words dham and karmara refer to iron-welders. However, philological evidence indicates that ayas in the Rigveda refers only to copper and bronze, while iron or śyāma ayas, literally “black metal”, first is mentioned in the post-Rigvedic Atharvaveda, and therefore the Early Vedic Period was a Bronze Age culture whereas the Late Vedic Period was an Iron Age culture. The transition of Vedic society from semi-nomadic life to settled agriculture in the later Vedic age led to an increase in trade and competition for resources. Agriculture dominated the economic activity along the Ganges valley during this period. Agricultural operations grew in complexity and usage of iron implements (krishna–ayas or shyama–ayas, literally black metal or dark metal) increased. Crops of wheat, rice, and barley were cultivated. Surplus production helped to support the centralised kingdoms that were emerging at this time. New crafts and occupations such as carpentry, leather work, tanning, pottery, astrology, jewellery, dying, and winemaking arose. Apart from copper, bronze, and gold, later Vedic texts also mention tin, lead, and silver. Panis in some hymns refers to merchants, in others to stingy people who hid their wealth and did not perform Vedic sacrifices. Some scholars suggest that Panis were semitic traders, but the evidence for this is slim. Professions of warriors, priests, cattle-rearers, farmers, hunters, barbers, vintners and crafts of chariot-making, cart-making, carpentry, metal working, tanning, making of bows, sewing, weaving, making mats of grass and reed are mentioned in the hymns of the Rigveda. Some of these might have needed full-time specialists. There are references to boats and oceans. Book X of the Rigveda refers to both eastern and western oceans. Individual property ownership did not exist and clans as a whole enjoyed rights over lands and herds. Enslavement (dasa, dasi) in the course of war or as a result of non-payment of debt is mentioned. However, slaves worked in households rather than production-related activities. A steel engraving from the 1850s, which depicts the creative activities of Prajapati, a Vedic deity who presides over procreation and protection of life. Texts considered to date to the Vedic period are mainly the four Vedas, but the Brahmanas, Aranyakas and the older Upanishads as well as the oldest Śrautasutras are also considered to be Vedic. The Vedas record the liturgy connected with the rituals and sacrifices performed by the 16 or 17 Śrauta priests and the purohitas. The rishis, the composers of the hymns of the Rigveda, were considered inspired poets and seers (in post-Vedic times understood as “hearers” of an eternally existing Veda, Śrauta means “what is heard”). The mode of worship was the performance of sacrifices (Yajna) which included the chanting of Rigvedic verses (see Vedic chant), singing of Samans and ‘mumbling’ of sacrificial mantras (Yajus). Yajna involved sacrifice and sublimation of the havana sámagri (herbal preparations) in the fire accompanied by the chanting of the Vedic mantras. The sublime meaning of the word yajna is derived from the Sanskrit verb yaj, which has a three-fold meaning of worship of deities (devapujana), unity (saògatikaraña) and charity (dána). An essential element was the sacrificial fire—the divine Agni—into which oblations were poured, as everything offered into the fire was believed to reach God. People prayed for abundance of rain, cattle, sons, long life and gaining ‘heaven’. Vedic people believed in the transmigration of the soul, and the peepul tree and cow were sanctified by the time of the Atharvaveda. Many of the concepts of Indian philosophy espoused later like Dharma, Karma etc. trace their root to the Vedas. The main deities of the Vedic pantheon were Indra, Agni (the sacrificial fire), and Soma and some deities of social order such as Mitra–Varuna, Aryaman, Bhaga and Amsa, further nature deities such as Surya (the Sun), Vayu (the wind), and Prithivi (the earth). Goddesses included Ushas (the dawn), Prithvi, and Aditi (the mother of the Aditya gods or sometimes the cow). Rivers, especially Saraswati, were also considered goddesses. Deities were not viewed as all-powerful. The relationship between humans and the deity was one of transaction, with Agni (the sacrificial fire) taking the role of messenger between the two. Strong traces of a common Indo-Iranian religion remain visible, especially in the Soma cult and the fire worship, both of which are preserved in Zoroastrianism. Ethics in the Vedas are based on the concepts of Satya and Rta. Satya is the principle of integration rooted in the Absolute. Whereas, Ṛta is the expression of Satya, which regulates and coordinates the operation of the universe and everything within it. Conformity with Ṛta would enable progress whereas its violation would lead to punishment. Around the beginning of the Common Era, the Vedic tradition formed one of the main constituents of the so-called “Hindu synthesis“. Vedic religion survived in the srayta ritual, whereas ascetic and devotional traditions like Yoga and Vedanta acknowledge the authority of the Vedas, but interpret the Vedic pantheon as a unitary view of the universe with ‘God’ (Brahman) seen as immanent and transcendent in the forms of Ishvara and Brahman. Later texts such as the Upanishads and epics, namely the Gita of Mahabharat, are essential parts of these later developments. 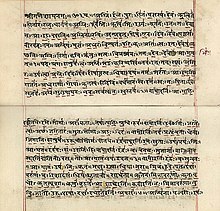 An early 19th-century manuscript of Rigveda (padapatha) in Devanagari. The Vedic accent is marked by underscores and vertical overscores in red. Rigvedic text: The Rigveda is by far the most archaic of the Vedic texts preserved, and it retains many common Indo-Iranian elements, both in language and in content, that are not present in any other Vedic texts. Its time span likely corresponds to the Late Harappan culture, Gandhara Grave culture and Ochre Coloured Pottery culture. Mantra language texts: This period includes both the mantra and prose language of the Atharvaveda (Paippalada and Shaunmkiya), the Rigveda Khilani, the Samaveda Samhita (containing some 75 mantras not in the Rigveda), and the mantras of the Yajurveda. Many of these texts are largely derived from the Rigveda, but have undergone certain changes, both by linguistic change and by reinterpretation. Conspicuous changes include change of vishva “all” by sarva, and the spread of the kuru- verbal stem (for Rigvedic krno-). This is the time of the early Iron Age in north-western India, corresponding to the Black and Red Ware (BRW) and Painted Grey Ware (PGW) cultures, and the early Kuru Kingdom, dating from c. the 12th to 11th century BCE. Samhita prose texts: This period marks the beginning of the collection and codification of a Vedic canon. An important linguistic change is the complete loss of the injunctive. The Brahmana part (‘commentary’ on mantras and ritual) of the Black Yajurveda (MS, KS, TS) belongs to this period. Archaeologically, the Painted Grey Ware (PGW) culture from c. 1000 or 900 BCE corresponds to the Kuru Kingdom and the subsequent eastward shift of the political centre from the Kurus to the Panchalas on the Ganges. Brahmana prose texts: The Brahmanas proper of the four Vedas belong to this period, as well as the Aranyakas, the oldest of the Upanishads (BAU, ChU, JUB) and the oldest Śrautasutras (BSS, VadhSS). 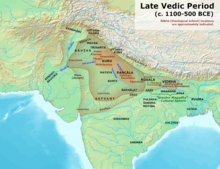 In the east, Videha (N. Bihar and Nepal) is established as the third main political centre of the Vedic period. Sutra language texts: This is the last stratum of Vedic Sanskrit leading up to c. 500 BCE, comprising the bulk of the Śrauta and Grhya Sutras, and some Upanishads (e.g. KathU, MaitrU). Michael Witzel (2001), “Autochthonous Aryans? The Evidence from Old Indian and Iranian Texts”, in Electronic Journal of Vedic Studies (EJVS), vol. 7–3, pp. 1–93. Shereen Ratnagar (2008), “The Aryan homeland debate in India”, in P. L. Kohl, M. Kozelsky and N. Ben-Yehuda (edd. ), Selective remembrances: archaeology in the construction, commemoration, and consecration of national pasts, pp. 349–378. Suraj Bhan (2002), “Aryanization of the Indus Civilization” in K. N. Panikkar, T. J. Byres and U. Patnaik (edd. ), The Making of History, pp. 41–55. ^ a b Stein 2010, p. 50. ^ a b Witzel 1995, p. 3-5. ^ a b Samuel 2010, p. 49-52. ^ a b Flood 1996, p. 82. ^ a b Hiltebeitel 2002. ^ a b c d e Witzel 1989. ^ Pletcher, Kenneth (2010). The History of India. Britannica Educational Publishing. p. 60. ^ Witzel 1995, p. 3. ^ Samuel 2010, p. 41. ^ Floodl 1995, p. 30, 33-35. ^ Anthony, The Horse, the Wheel and Language 2007, p. 410-411. ^ a b c Anthony, The Horse, the Wheel and Language 2007, p. 454. ^ Anthony, The Horse, the Wheel and Language 2007, p. 375, 408–411. ^ Anthony, The Horse, the Wheel and Language 2007, p. 408. ^ Beckwith, 2009 & 33, 35. ^ a b Beckwith, 2009 & 33. ^ Beckwith, 2009 & 34. ^ Anthony, The Horse, the Wheel and Language 2007. ^ Bryant & Patton 2005, p. 342. ^ Jamison, Stephanie W. (2006). “The Indo-Aryan controversy: Evidence and inference in Indian history (Book review)” (PDF). Journal of Indo-European Studies. 34: 255–261. ^ Mallory & Adams 2006, p. 460-461. ^ & Upinder Singh, A History of Ancient and Early Mediaeval India 2008, p. 186. ^ Flood 1996, p. 31. ^ Flood 1996, p. 37. ^ Witzel 1995, p. 4. ^ Flood 1996, p. 30. ^ Woodard, Roger D. (18 August 2006). Indo-European Sacred Space: Vedic and Roman Cult. University of Illinois Press. pp. 242–. ISBN 978-0-252-09295-4. ^ a b Anthony, The Horse, the Wheel and Language 2007, p. 462. ^ Anthony, The Horse, the Wheel and Language 2007, p. 454 f..
^ a b & Upinder Singh, A History of Ancient and Early Mediaeval India 2008, p. 192. ^ Kulke & Rothermund 1998, p. 38. ^ Erdosy 1995, p. 335. ^ Hiltebeitel 2001, p. 2, note 12. ^ Singh, Upinder (2008). A History of Ancient and Early Medieval India: From the Stone Age to the 12th Century. Pearson Education India. p. 187. ^ a b c Basham, The Wonder that was India 2008, p. 32. ^ Reddy 2011, p. 103. ^ a b Kulke & Rothermund 1998, pp. 37–38. ^ a b Samuel 2010, p. 49. ^ Tignor, Robert L. (2014). Worlds together, worlds apart: a history of the world from the beginnings of humankind to the present (fourth ed.). New York: W. W. Norton & Company. ISBN 9780393922073. OCLC 854609153. ^ Kaushik, Roy (2013). Military manpower, armies and warfare in South Asia. London: Pickering & Chatto. ISBN 9781848932920. OCLC 827268432. ^ Kulke & Rothermund 1998, pp. 37–39. ^ & Upinder Singh, A History of Ancient and Early Mediaeval India 2008, p. 200. ^ a b c d e f g h Witzel 1995. ^ Samuel 2010, p. 48-51, 61-93. ^ Hiltebeitel 2007, p. 8-10. ^ Samuel 2010, p. 49-50. ^ Kulke & Rothermund 1998, pp. 39–40. ^ Avari, Burjor (2016). India: The Ancient Past: A History of the Indian Subcontinent from C. 7000 BCE to CE 1200. Routledge. p. 89. ^ Kulke & Rothermund 1998, pp. 39-41. ^ Kulke & Rothermund 1998, pp. 41–43. ^ Witzel 1995, p. 2-8. ^ a b Samuel 2010, p. 48-56. ^ a b Basham, The Wonder that was India 2008, p. 42. ^ H. C. Raychaudhuri (1972), Political History of Ancient India, Calcutta: University of Calcutta, p.67–68. ^ Olivelle 1998, pp. xxviii–xxix. ^ Basham 208, p. 40. ^ Basham 208, p. 41. ^ Majumdar 1998, p. 65. ^ Majumdar 1998, p. 66. ^ Fortson 2011, p. 208. ^ Sen 1999, pp. 117–120. ^ Samuel 2010, p. 48-51; ch. 3. ^ Long 2013, p. chapter II. ^ Staal 2008, p. 54. ^ a b c d e f g & Upinder Singh, A History of Ancient and Early Mediaeval India 2008, p. 191. ^ a b c Basham, The Wonder that was India 2008, p. 35. ^ & Upinder Singh, A History of Ancient and Early Mediaeval India 2008, pp. 201–203. ^ & Upinder Singh, A History of Ancient and Early Mediaeval India 2008, p. 204. ^ Olivelle 1998, p. xxvi. ^ & Upinder Singh, A History of Ancient and Early Mediaeval India 2008, pp. 204–206. ^ Olivelle 1998, p. xxxvi. ^ Majumdar 1977, p. 45. ^ Basham, The Wonder that was India 2008, pp. 33–34. ^ Basham, The Wonder that was India 2008, p. 41. ^ a b & Upinder Singh, A History of Ancient and Early Mediaeval India 2008, pp. 200–201. ^ Witzel’s study is furthermore cited by Alf Hiltebeitel, Dharma: Its Early History in Law, Religion, and Narrative, Oxford University Press, 2011, p. 57 (online); Proferes, Theodore (2003), “Kuru kings, Tura Kavaseya and the -tvaya Gerund”, in Bulletin of the School of Oriental and African Studies, vol. 66 (2), pp. 210–219 (online). ^ Bellah, Robert N. Religion in Human Evolution (Harvard University Press, 2011), p. 491 f. (online). ^ Bellah 2011, 697-98: citing the terminology of Bruce Trigger, Understanding Early Civilizations (online). ^ Cited by Bellah 2011, p. 698 f. (online). ^ Bellah 2011, p. 509, citing Patrick Olivelle’s introductory remarks to his translation of the Upanishads (online). ^ Erdosy, George. “The prelude to urbanization: ethnicity and the rise of Late Vedic chiefdoms,” in The Archaeology of Early Historic South Asia: The Emergence of Cities and States, ed. F. R. Allchin (Cambridge University Press, 1995), pp. 75–98 (online). ^ Erdosy, George. “City states of North India and Pakistan at the time of the Buddha,” in The Archaeology of Early Historic South Asia: The Emergence of Cities and States, ed. F. R. Allchin (Cambridge University Press, 1995), p. 99–122 (online). ^ a b & Upinder Singh, A History of Ancient and Early Mediaeval India 2008, p. 190. ^ Kulke & Rothermund 1998, p. 40. ^ Olivelle, 1998 & xxvii. ^ & Upinder Singh, A History of Ancient and Early Mediaeval India 2008, pp. 198–199. ^ Basham, The Wonder that was India 2008, pp. 42–43. ^ Nigal, S.G. Axiological Approach to the Vedas. Northern Book Centre, 1986. P. 81. ISBN 81-85119-18-X. ^ Singhal, K. C; Gupta, Roshan. The Ancient History of India, Vedic Period: A New Interpretation. Atlantic Publishers and Distributors. ISBN 8126902868. P. 150-151. ^ *Day, Terence P. (1982). The Conception of Punishment in Early Indian Literature. Ontario: Wilfrid Laurier University Press. P. 42-45. ISBN 0-919812-15-5. Witzel, Michael (1989), “Tracing the Vedic dialects”, Dialectes dans les litteratures Indo-Aryennes ed. Caillat, Paris, 97–265. Lokmanya Bal Gangadhar Tilak, The Arctic Home in the Vedas, Messrs Tilak Bros., 1903. R. C. Majumdar and A. D. Pusalker, eds. The History and Culture of the Indian People. Volume I, The Vedic age. Bharatiya Vidya Bhavan, Bombay 1951. R. C. Majumdar et al. An Advanced History of India, MacMillan, 1967.